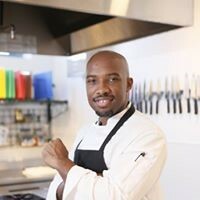 Washington, D.C. — Central Union Mission is thrilled to announce that Hell’s Kitchen winner Chef Rahman “Rock” Harper has added Mission “Executive chef” to his broad list of culinary projects. Chef Rock’s supervision will advance the Mission kitchen’s efficiency, effectiveness and creativity. Chef Rock Harper discovered his love of cooking in his early teens and earned a culinary degree at Johnson & Wales University. Harper has held positions at Café Calliope, Burke Station Restaurant, Planet Hollywood and BET on Jazz Restaurant, and was executive chef at B.Smith’s Restaurant, Ben’s Next Door, The Carlyle Club and The Howard Theatre. He served on the board of DC Central Kitchen and as director of kitchen operations as well as being an instructor both at DC Central Kitchen and Stratford University. In 2010, he published the book “44 Things Parents Should Know about Healthy Cooking for Kids.” He was the National Celebrity Chef for the March of Dimes from 2008 to 2012. In 2007, Harper won season three of the Fox reality-television show Hell’s Kitchen. In 2013, he appeared on Chef Wanted with Anne Burrell and won the executive chef position at The Precinct, a steakhouse in Cincinnati, Ohio; however, he did not ultimately accept the job. In addition to his charity work, Chef Rock is president of RockSolid Creative Food Group and creator of The Shift Drink Show, The Chef Rock Xperiment Podcast and Chef Rock’s Sunday Suppers. Please contact Deborah Chambers at 202-534-9965 or dchambers@missiondc.org to coordinate interviews. Central Union Mission is a faith-based 501(c)(3) nonprofit with its homeless shelter located at 65 Massachusetts Ave., NW, Washington, DC 20001, missiondc.org. In addition to its emergency shelter program, the Mission operates rehabilitative and job training programs for men, a clothing and furniture distribution center, a retreat and recreation center with a camp for underprivileged children and a ministry to families and senior citizens. Charity Navigator awarded Central Union Mission four out of a possible four stars, which indicates that Central Union Mission adheres to good governance and other best practices that minimize the chance of unethical activities and consistently executes its mission in a fiscally responsible way. Charity Navigator is America’s premier independent charity evaluator.